Teams are incredibly powerful forces in business. Getting your people aligned with the same goals is critical; however, executive team building can be challenging. Getting a diverse group to realize this concept and pull together is a fine art. How can organizations create strong teams? Michael’s answer may surprise you: constructive meetings! One of the most important aspects of executive team building is having regular meetings — perhaps somewhat different than the ones you are accustomed to attending. Michael Whatmore discusses how to create sessions that are productive as well as conducive to executive team building and that can progress towards attaining strategic goals. From setting expectations for communications and employee-driven agendas to ensuring active participation from members and delegating responsibilities, the focus of team meetings is on creating a forum for discussion and growth. How do you get people to contribute? How do you begin the discussion? How do you decide on topics and responsibilities? How do you follow up and track results? 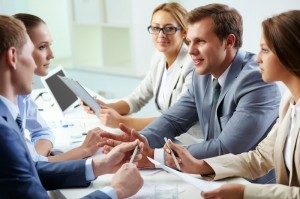 As these and other issues are discussed, leaders will gain a clear understanding of how to implement effective meetings in their companies, an essential core foundation for executive team building.